Case. Zippered main compartment. 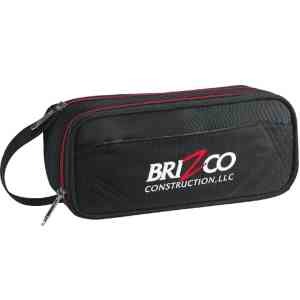 Front zippered pocket includes attached built-in Tech Trap elastic organizer panel for maximum storage and organization. Additional elastic organization on the interior of front panel. Front padded pocket. Side grab handle. Multi-function design for use as a tech organizer for accessories and cords, small dopp kit or personal golf caddy. Signature elleven lining and hardware. 4" x 10" x 4.75"